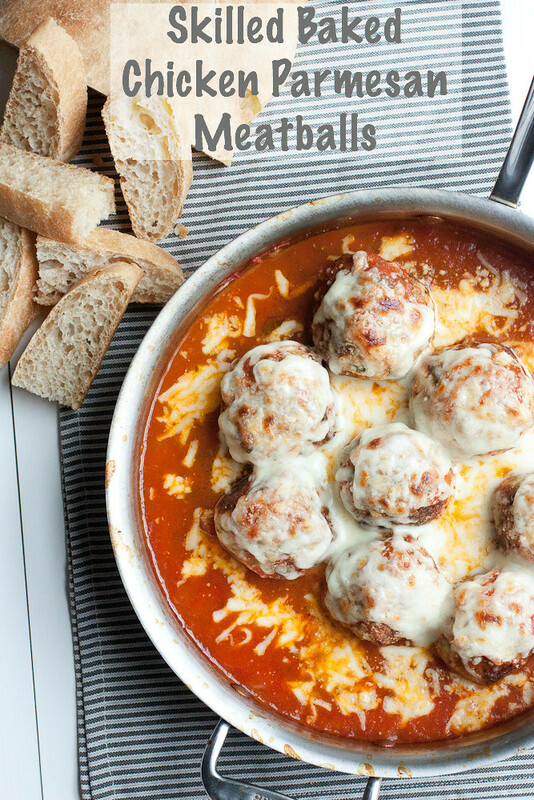 These skillet baked chicken parmesan meatballs will be one of these easiest and most satisfying meals you’ll make all year. They’re just as perfect for a chilly late summer or early fall evening as they are in the dead of winter. Served with some fresh, warm bread? Life is good. It’s starting to feel like fall already, isn’t it? I know some of you in Colorado and Calgary have already gotten some snow and I can’t help but feel a tinsy bit jealous. Pretty soon our pumpkins will be out on the porch and we’ll be filling our bellies some of our fall favorites like classic slow cooker chili, smoky black bean soup, and chicken and biscuits pot pie. 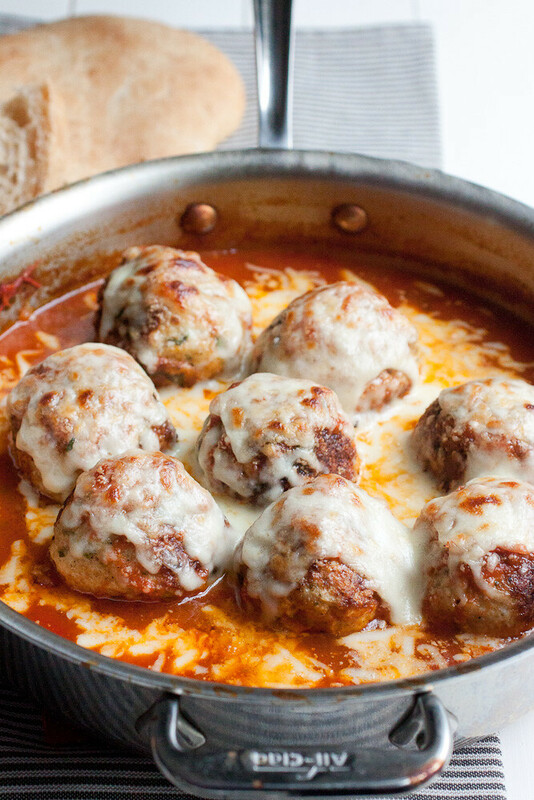 These skillet baked chicken parmesan meatballs rank right up there with some of the best meals we like to make this time of year. I made these chicken parmesan meatballs last year for grilled sandwiches (stellar!) but loved that Annie browned then baked them in some sauce. My stomach has been growling for them since I saw her version and I had to follow suit. So we heated up some of our marinara sauce, plunked the browned meatballs in the sauce, smothered them in mozzarella cheese and baked them off until the cheese was splotchy-brown and the meatballs were baked through. 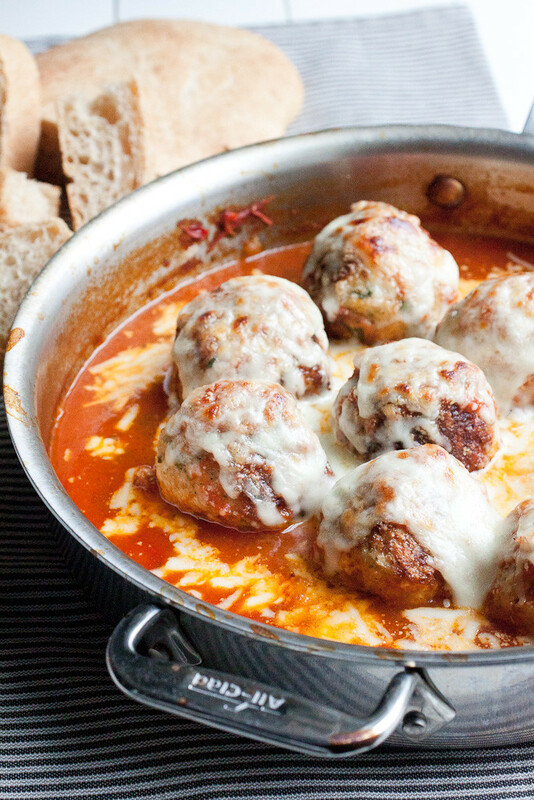 We soaked up the sauce with hunks of fresh ciabatta bread and enjoyed the chicken parmesan meatballs dripping with hot, stringy mozzarella on their own. No pasta was needed here; it’s a full cozy comfort meal on its own! If you can only find ground chicken in a 1 ¼ or 1 ½ lb package, use the full amount and don’t adjust the amounts of the other ingredients – the end result will still be excellent and you’ll end up with more meatballs, which is never a bad thing! To make the meatballs: Preheat oven to 400° F.
Add all of the meatball ingredients to a large bowl and with a fork, stir lightly until well-combined. Using a medium cookie or ice cream scoop, portion out the meatball mixture into 2-inch meatballs, shaping each into a ball with your hands – lightly damp hands help to prevent sticking. Heat the oil in a large skillet and brown the meatballs on all sides. Add the sauce to the pan, divide the cheeses between the meatballs, topping each with a fair amount of cheese. Bake for 15 minutes. Turn the broiler on for an extra minute to lightly brown the cheese. Sprinkle the meatballs with some chopped basil or parsley, if desired. Serve straight from the pan on small plates with bread on the side or over a bed of pasta or quinoa. I am a meatball fan. This is a winner in my book! LOVE these meatballs! Total comfort food + a crowd pleaser!